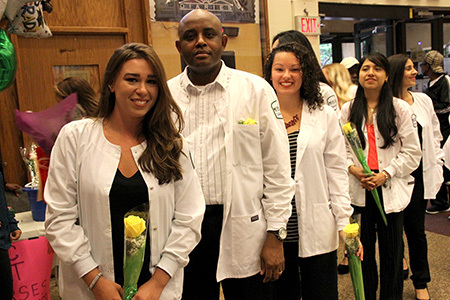 West Windsor, N.J. – Forty-one graduating Nursing students were sent off into the healthcare field with a grand salute from Mercer County Community College (MCCC). 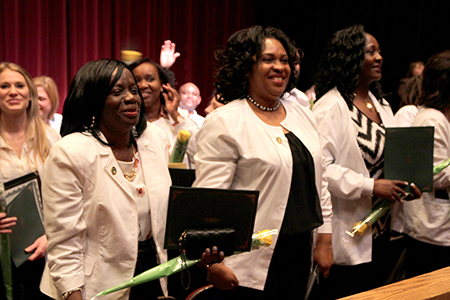 The Nursing program held its Pinning Ceremony on May 17, with Director of Nursing Donna Penn presiding over her final ceremony. After reviewing the lengthy and challenging list of learning outcomes required of graduating nurses, Penn noted her confidence in this class. “You will make Mercer proud and serve the community well,” she said. In her remarks to the graduates, President Jianping Wang congratulated them for their audacity to dream. "We celebrate you for your perseverance and drive. This is a major milestone after a long journey," she said. Dr. Wang emphasized that nursing is not for the weak. “Nursing is a calling. You will have hard days and make multiple sacrifices,” she said, noting that numerous grads hail from families with long traditions of nursing. "One graduate comes from a family of five nurses. Another grad's mother has been a nurse for 40 years. Still another will join his wife in the profession," Dr. Wang said. Valedictorian Joy Ugorji spoke on behalf of her fellow classmates. “I stand before you with great joy and deep gratitude. Nursing school has been one of the best times of my life. This is the day we have worked so hard for,” she said. Ugorji praised MCCC for the beauty of its campus, the high quality of the Nursing faculty, and the camaraderie and diversity of the student body. “The program stands for excellence. We became like a caring family, laughing and crying together. We learned empathy and selflessness,” she said. “It could not have been possible without our dear professors, who stood with us every step of the way. The Nursing Program has given us a solid foundation. Now it’s time for us to build on it. We have been taught and now it’s time to give back,” Ugorji concluded to enthusiastic applause. Ugorji, along with Christopher Pothier, Samantha Moreland, Rachel Mynes and Christopher Reiser, were selected by the faculty for special awards. The 41 members of the May Nursing Class. 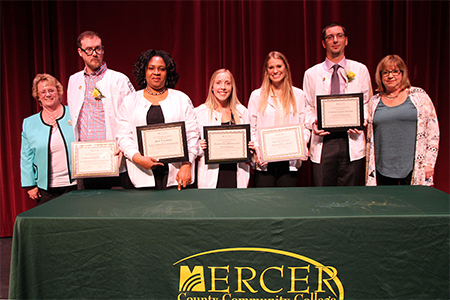 From left, Director of Nursing Donna Penn, award winners Christopoher Pothier, Joy Ugorji, Samantha Moreland, Rachel Mynes and Christopher Reiser, and Professor Tony Racioppo. Valedictorian Joy Ugorji, center, with fellow grads. Members of the class line up prior to the Pinning Ceremony.